What Are These Forgotten Hollywood Celebrities Up To? It’s a tough life out there for celebs. You’re thrown into the spotlight and immediately fall under the scrutiny of the general public. Maybe they’ll love you, maybe they won’t. But the hardest task of all is being remembered. Kicking off our list of forgotten Hollywood celebrities is…Seann. Firstly, who ever knew that Seann’s name had two ‘n’s? TWO. But what actually has he been doing since American Pie? Where’s he been? WE MUST KNOW, SEANN WITH TWO ‘N’S. Sadly he’s failed to return any of my desperate tweets, so I’ve had to turn to the reliable interwebs for all inside information. IMDb reveals that he’s starred in the well-known film ‘Balls Out: Gary the Tennis Coach’, in which ‘he begins coaching his beloved sport to a group of misfits and leads them to the Nebraska State Championships.’ Soz for the spoilers. Sadly, ‘Balls Out: Gary the Tennis Coach’ did not get the glowing reviews that some would say could be expected. However, the 27 users on Twitter who used the hashtag #BallsOutGaryTheTennisCoach couldn’t disagree with critics more, with LOL’s and LMAO’s aplenty. Seann is currently working on the sports comedy film Goon: Last of the Enforcers, a sequel to 2011’s Goon. She stole our hearts as Marissa, but things all went a little quiet in camp Barton following her OC success. But why oh why? Because she’s been chilling with Noel Gallagher, THAT’S WHY. Starring as ‘girl in taxi’ in the music video for Noel Gallagher’s High Flying Birds, she cruelly gets stripped naked when getting her dress caught in a taxi door as it drove off into the distance. Mischa did what any of us would do though. She ran after that taxi in nothing but her undies with a pained expression on her face. For miles. Because she really loved that dress and clothes ain’t as cheap as they used to be. She does look great though. Since then, she’s launched her own range of iPhone cases amid headlines of possibly having her Audi repossessed. She also stars in a new film ‘Starcrossed’, which is set to be released this year. Go on Mischa, we’re all rooting for ya! Lord of the Rings fans everywhere may be wondering where Liv’s gone to of late. Fear not fans, she’s still around and very much in our lives – even though we may not realise. Since her last major film role in The Incredible Hulk, she’s most recently been playing Meg Abbott in TV series The Leftovers. 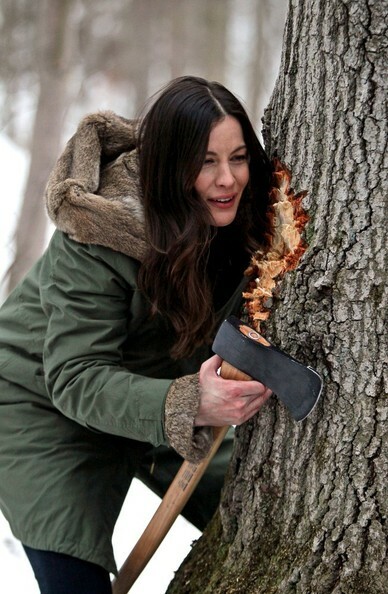 Here she is with an axe. Ahh Liv, you’ve not changed. She’s also served as a Goodwill Ambassador for the United Nations Children’s Fund because she’s just lovely like that. Whether playing Wayne or Austin, Mike’s created some legendary characters that we all know and love. Which is why we just had to put him in our list of forgotten Hollywood celebrities: just what is Mike up to nowadays? The answer is…..not tooooo much. He did some voiceover work in Shrek Forever After. And Scared Shrekless (what?). And Donkey’s Christmas Shrektacular. I could go on, but I won’t. Mainly for the fear of saying ‘Shrek’ too many times. He DID however, make a cameo as Dr Evil on Saturday Night Live, which was quite wonderful. And more excitingly, he will be returning to our screens after agreeing to star in Austin Powers 4, which should hit our screens in 2016 or 2017. Duhhh duh duh DUHHH. That was the Buffy intro music, in case you were unsure. Rounding off our list of forgotten Hollywood celebrities is one of our favourite late 90s/early 00s starlets. Sarah’s been starring in a bunch of TV shows since her vampy days, including Robot Chicken with Seth Green and Princess Rap Battle as Cinderella, which is possibly the best idea ever. There are even subtitles so you can rap along if you’re so inclined. Sarah is totally winning at life. Enjoyed this article on forgotten Hollywood celebrities? Then you’re in luck. You’ll probably like some of RiseFeed’s other content, including 6 Celebrities Who Have Stormed Out Mid-Interview and 8 Times You Wished You Were Shia Labeouf.